Two fight announcements slipped under the radar over the weekend, as Trevor Smith is set to face Ed Herman at UFC on Fox 8, and Kazuki Tokudome is fighting Norman Parke at UFC 162. Amidst the hustle and bustle of the UFC 159 buildup, two fight announcements got left out in the cold. 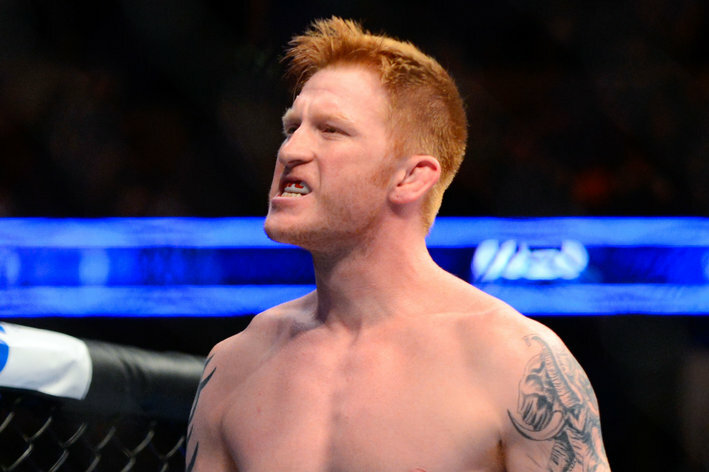 UFC officials announced Friday that Ed Herman would be facing Trevor Smith at UFC on Fox 8. Also announced, Norman Parke and Kazuki Tokudome for UFC 162. Herman returns after a one-off fight under the Strikeforce banner where he lost to Ronaldo Souza by first round kimura. His last fight in the UFC saw him drop a unanimous decision to Jake Shields, which was later overturned after Shields failed his post fight drug test. Trevor Smith has been a staple on the Strikeforce Challengers series, but was most recently seen on the undercard of Strikeforce: Marquardt vs. Saffiedine, losing by third round submission to Tim Kennedy. Smith is the latest of the Strikeforce transfers, and to be honest it’s a bit surprising that he made the jump. He brings with him a 10–3 record with losses to Gian Villante and Devin Cole. This has all the makings of a win or get cut fight for both men. Herman has had a long tenure with the company, but he’s had back to back poor performances, and while I’m sure the UFC feels grateful to him for stepping up and taking the fight with “Jacare,” I doubt that generosity would last through a third loss. Ultimate Fighter winner Norman Parke (17–2) will make his return to the octagon for the first time since his victory on the TUF Smashes finale (UFC on FX 6: Sotiropoulos vs. Pearson) over Colin Fletcher. Unfortunately for Parke, much of the wind has been taken out of his TUF sails, as Fletcher has already been released from the promotion following his second loss. Kazuki Tokudome was a somewhat surprising acquisition by the UFC from Pancrase. He’s 12–3–1 which means he’s avoided much of the draw heavy decisions endemic to Japanese MMA. His only recent loss is to young Pancrase champion Isao Kobayashi. He won a well earned unanimous decision over Cristiano Marcello at UFC on Fuel TV 8: Silva vs. Stann, and looks to have some promise if he can work on his striking defense. All told this is probably a better build-up fight for Parke than it is for Tokudome, but its a good opportunity for both fighters to start separating themselves from the bottom end of the Lightweight division. A couple days ago it was a rumor. Today it is a fact. Jake Shields (25-4-1) confirmed his inevitable signing with the UFC via Twitter, as well as his first opponent with the promotion, Martin Kampmann. The former Strikeforce Middleweight Champion has come to terms with the UFC after getting his release from his contract with the San Jose-based mixed martial arts promotion he’s called home since the collapse of Elite XC nearly two years ago. During his recent negotiations, Shields flirted with the UFC and spoke publicly about his desire to fight Octagon champions Georges St. Pierre (welterweight) and Anderson Silva (middleweight). He also served as assistant coach to Chuck Liddell on Season 11 of The Ultimate Fighter (TUF). While he competed in the 185-pound class in Strikeforce, Shields is a natural 170-pound competitor and has the flexibility to move between weight classes depending on what opportunities present themselves. For now, he’ll concentrate on his longtime goal of facing St. Pierre should “Rush” defeat Josh Koscheck (again) later this year with his first step in that direction coming in the form of a top-flight welterweight scrap with Martin Kampmann. Kampmann has done some recent damage himself, welcoming another high profile welterweight to the Octagon when former WEC stud Carlos Condit debuted at UFC Fight Night 19 back in April 2009. “The Hitman” emptied his clip into Jacob Volkmann when “Christmas” rang in the New Year for the injured Rory Markham at the UFC 108: “Evans vs. Silva” event earlier this year. It was a much needed win for the Dane, who saw his title aspirations evaporate at the hands of Paul “Semtex” Daley back at UFC 103: “Franklin vs. Belfort” in September 2009. In addition to the win over “Natural Born Killer,” Kampmann is 13-2 since 2004 and like Shields, has also done time as a middleweight. He is of course coming off a dominant win over the man that many pegged as a future welterweight title challenger, Paulo Thiago, at UFC 115 last month. A win over the surging Shields would likely vault Martin back to the top of the 170-pound division. Shields vs. Kampmann at UFC 121: Who ya’ got? With Jake Shields UFC debut practically a foregone conclusion, the wheels are in motion to find him a suitable opponent for his return to the 170-pound division. A quick run through the SB Nation top ten rankings will yield plenty of suitors; however, everyone with a spot high enough on the totem pole to welcome the former Strikeforce and Elite XC champion has already secured a date to the big dance. That leaves Martin Kampmann and Paulo Thiago — and the Dane already disposed of the crafty Brazilian at UFC 115 just last month, effectively securing his position as the last man standing. 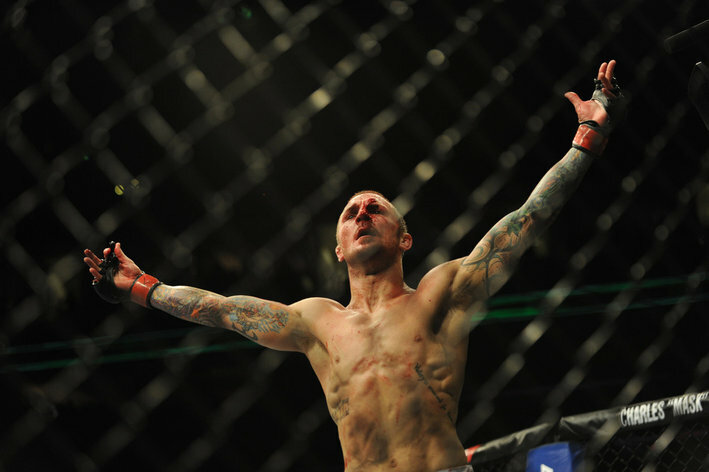 And a win over Shields would likely ease some of the pain he felt when his desired opponent, Dan “The Outlaw” Hardy, was paired up with Carlos Condit for the upcoming UFC 120 event across the pond. The Cesar Gracie product has remained undefeated over five years across the span of 14 fights. Some of his most recent victims include Dan Henderson, Robbie Lawler and Jason Miller. Kampmann has done some damage himself, welcoming another high profile welterweight to the Octagon when former WEC stud Carlos Condit debuted at UFC Fight Night 19 back in April 2009. Jake Shields vs. Martin Kampmann at UFC 121 — how does that sound, Maniacs? Former Strikeforce Middleweight Champion Jake Shields (25-4-1) has sealed the deal with the UFC after getting his release from his contract with the San Jose-based mixed martial arts promotion he’s called home since the collapse of Elite XC nearly two years ago. After a successful title run under the Pro Elite banner from 2007-08, Shields was picked from the rubble by Scott Coker and Co. following the financial implosion of Elite XC, expedited by Kimbogate on the “Heat” fight card in October 2008. 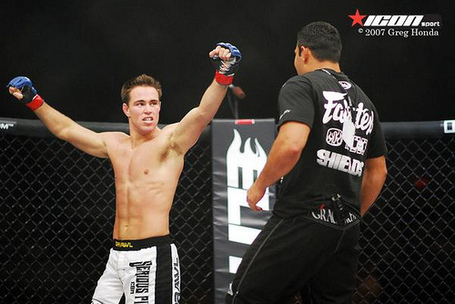 The Cesar Gracie disciple made his Strikeforce debut against Robbie Lawler in June 2009, strangling the former UFC brawler with a “Ruthless” guillotine just past the two minute mark in the first round of their main event attraction. Back-to-back decision wins over Jason “Mayhem” Miller and Dan Henderson on CBS would follow, leaving Shields with an option to stay for one more fight or head for greener pastures, depending on the promotion’s ability to meet his salary requirements for one last ride. Able, but apparently not willing. While he competed in the 185-pound class in Strikeforce, Shields is a natural 170-pound competitor and has the flexibility to move between weight classes depending on what opportunities present themselves. For now, he’ll concentrate on his longtime goal of facing St. Pierre should “Rush” defeat Josh Koscheck (again) later this year. In the interim, Shields will be paired up with a “top contender” shortly. Any guesses as to who it might be? Seems like the only available welterweight at this time is the always-dangerous Martin “The Hitman” Kampmann. Anyone have a better match-up? Let’s hear your predictions Maniacs. Strikeforce Middleweight Champion Jake Shields has been released from his contract with Strikeforce, the San Jose-based mixed martial arts promotion he’s called home since the collapse of Elite XC nearly two years ago, according to a report from Sherdog.com. During his recent negotiations, Shields flirted with the UFC and spoke publicly about his desire to fight Octagon champions Georges “Rush” St. Pierre (welterweight) and Anderson “The Spider” Silva (middleweight). Of course his debut as a Zuffa employee is not yet confirmed, but widely accepted as a foregone conclusion in light of his release from Strikeforce. UFC President Dana White has gone on the record stating he’ll “definitely” sign the grappling stud on multiple occasions. In his absence, Strikeforce will likely proceed with a 185-pound tournament to determine a new champion. So, now that the wheels are in motion, what match-ups intrigue you the most? Does Shields automatically get a crack at the winner of Georges St. Pierre vs. Josh Koscheck? Or does he need to prove his merit against the winner of Jon Fitch vs. Thiago Alves? Or maybe straight to the winner of Chael Sonnen vs. Anderson Silva? UFC President Dana White is definitely using the word “definitely” again, this time in predicting the definite future home of Strikeforce Middleweight Champion Jake Shields. The grappling wizard gave UFC import Dan Henderson a rude awakening at last Saturday’s “Nashville” event to retain his title and dramatically increase his market value. The San Jose-based fight promotion is running out of time to exercise their remaining fight option and could be looking at a hefty price tag to re-sign him and keep him out of the UFC. Definitely. Current Strikeforce middleweight champion and undeafeted since 2004, Jake Shields comes off thirteen victories in a row and now has the hardest match of his career versus Dan Henderson on April 17. Shields has been training jiu-jitsu with friends Nick and Nate Diaz and experienced a six-week camp with Robert Drysdale in Las Vegas recently where also had the opportunity of helping Chuck Liddell as BJJ coach for the 11th season of The Ultimate Fighter. Jake is going to do the last fight of the current contract and after that will talk to both Strikeforce and UFC to decide what organization he will fight for. Is Shields a good name for UFC? Do you think he is able to beat Silva or St-Pierre –or won’t even get past Henderson?